A wonderfully relaxed Ginza, full of empty space, with magnificent willow trees, a simple sandy road and a horse-drawn street car. It can hardly be any more different from the Ginza that we know today. Photographer Kimbei Kusakabe (1841-1934) stood near what is now the Wako Building and pointed his camera towards Kyobashi.1 The small clock tower rising above the trees stood on the Ginza Branch of the Kyoya Watch Shop (京屋時計店の銀座支店時計塔). The simple yet elegant clock tower was for many years the symbol of Ginza and appears in many a nishiki-e (woodblock print).2 It was located on Ginza 4-chome, which at the time was seen as the end of Ginza Avenue. Kyoya’s clock tower was designed by the architect Mizuno (水野伊和造, 1846-1906). Built in 1876 (Meiji 9), it stood until 1913 (Taisho 2) when the shop closed and the building was torn down. The clock itself was imported by the Swiss trader James Favre-Brandt (ジェームス・ファーブル・ブラント, 1841-1923). In 1863 (Kouka 3) he had come to Japan with a Swiss mission for establishing trade relations with Japan. Officially Favre-Brandt was an attaché, but in reality he came on his own account and expense.3 Quite enterprising, considering he was only 22 years old at the time. Where the Kyoya Watch Shop used to be, now stands the Ginza Sanwa Building, and right next to that is Matsuya Department Store, one of several premier department stores gracing Japan’s most expensive real estate, Ginza Avenue. 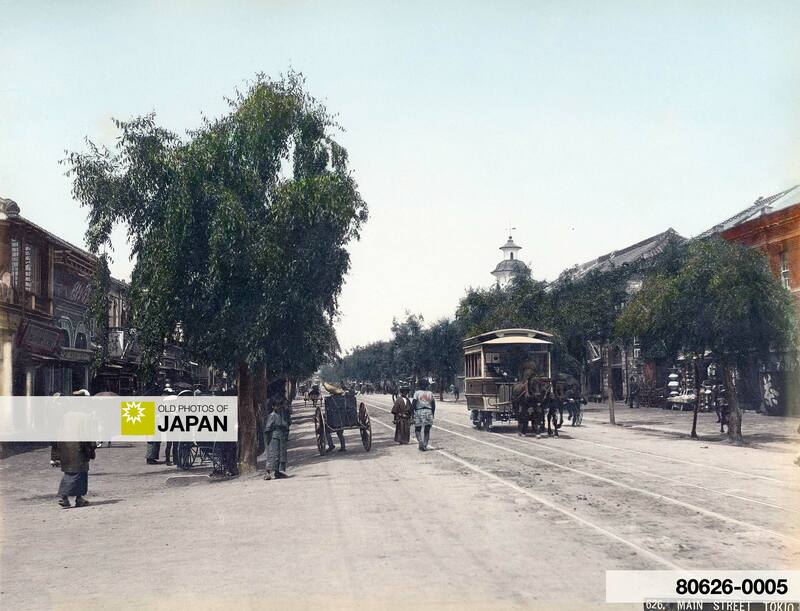 Tokyo’s horse-drawn streetcars, one of them gorgeously captured in this image, started operations on June 25, 1882 (Meiji 15), and connected Shinbashi with Asakusa. On August 22, 1903 (Meiji 36), the streetcars were electrified. By the following year, horse-drawn streetcars disappeared from the streets. In other words the view preserved on this image existed only for two decades. Ginza itself has a much longer history. The origins of the name Ginza date back to 1612 when a silver-coin mint (Ginza in Japanese) was built in the area. The area was called Shinryogae-cho (new money exchange district) because of the many money exchange houses located here. It didn’t take long for the people to name the area after the mint. Ginza finally became the area’s official name in 1869 (Meiji 2). Yet, that Ginza covered only 10% of the area known as Ginza today. It reached from Ginza 1-chome to 4-chome, shown above, and just one block east and west of Ginza Avenue. The newly minted Ginza was virtually destroyed in 1872 (Meiji 5) when a fire raged through the area consuming the wooden houses and shops. The disaster prompted Tokyo Prefectural Government to build more lasting structures and they contracted Irish born architect Thomas J. Waters to design Western style buildings. Originally, Ginza was adorned with willow, pine (松), maple (楓) and cherry trees, but only the hardy willow trees survived, in the event making them one of Ginza’s best known symbols. In 1921, when more space was given to vehicles and less to pedestrians, the willows were replaced with gingko trees. Two years later, The Great Kanto Earthquake struck, destroying any other remaining vestige of the old Ginza. The loss of the Ginza willows was felt so deeply that in 1929 (Showa 4) the song Tokyo March (東京行進曲), sung by Chiyako Sato (佐藤千代子, 1897-1968) became a great hit because it featured the words “I miss the willows of Ginza” (昔恋しい銀座の柳). Lyricist Yaso Saijo (西条八十, 1892-1970) and composer Shinpei Nakayama (中山晋平, 1887-1952)—both giants in the world of popular Japanese music—therefore created another song in 1932 (Showa 7) called Willows in Ginza (銀座の柳), which was sung by Fumiko Yotsuya (四家文子). It has become a peculiar Japanese custom to tear down an important part of history, and to then memorialize it with an unremarkable plaque. There are tens of thousands of these all over Japan which local governments proudly introduce in pamphlets and websites. The Ginza willows are no exception and Ginza Avenue features a small memorial to the Ginza willows engraved with the music of Willows in Ginza. This detail shows the streetcar, the clock tower and neatly displayed merchandise in front of a store. 2 The Japanese site kodokei.com displays a few wonderful woodblock prints featuring the Kyoya clock tower. 3 Mottini, Roger. Die Eidgenossen entdecken Japan. Universität Bern. 4 Greg Martin Auctions. Fine Antique Firearms, Edged Weapons and Curiosa. : Rare and Historic Japanese Marked Henry Model 1860 Repeating Lever Action Rifle Belonging to Swiss. Retrieved on 2009-05-28. 5 Another Swiss watchmaker, François Perregaux—like Favre-Brandt also hailing from the center of the Swiss watchmaking industry Le Locle in the Canton of Neuchâtel—arrived in Japan in December 1859. They actually became friends and Favre-Brandt is the executor of his will upon the death of Perregaux in 1877. Next to Perregaux’s Yokohama grave is a small marker with the engraving “Eliza Died 9 july 1864,” but it is unknown if Perregaux was married, and if so, whether his wife was Japanese. The November 12, 2008 edition of L’impartial carries an interesting feature on François Perregaux (pdf file). 6 中央区観光協会. 銀座柳の碑. Retrieved on 2009-05-28. You can also licence this image online: 80626-0005 @ MeijiShowa.com. Very nice photo. Deserves attention. Thank you. This is one of the photos that first made me fall in love with these old photographs of Japan. The hand-tinting is so delicate, and to be able to see what the Ginza looked liked in its infancy blows the mind. What a great site and I wish the People of Japan all the Best.I am a streetcar operator from Toronto Canada and this streetcar service began back in the 1930’s Here in Canada.In Light of the recent earthquake and Tsunami,I know your people are strong and resiliant.I stand with your people and I am greatly saddened by the number of casualties.We also began with horsedrawn streetcars.We are now awaiting new streetcars in 2013.The “Bombardier Flexity’s” as our fleet of streetcars is now reaching 30 years Old.I look forward to a wonderful trip to Japan in the not too distant future,and thank you again. @streetcarboy: Thanks. I spent six weeks in the disaster area right after the quake hit. It is far worse than it seems on TV. Usually, it is the other way around. @Rob Oechsle: Thanks, Rob! I don’t think I can ever come close to your research skills, though! @Alfred T Werner: Thank you. This is one of about three photographs that made me fall in love with vintage photography of Japan.